Use the form below to inquire about Heritage Resort At Panchkula . Use the form below to reserve for Heritage Resort At Panchkula . 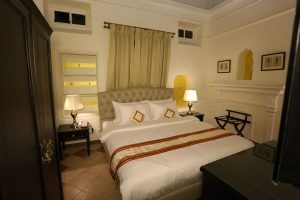 It is a spacious room with all modern amenities. It has a double bed and an en-suite bathroom. These rooms are in a Victorian Bungalow built in 1937. They have a mystical charm to them. The rooms have double beds and ensuite bathrooms. 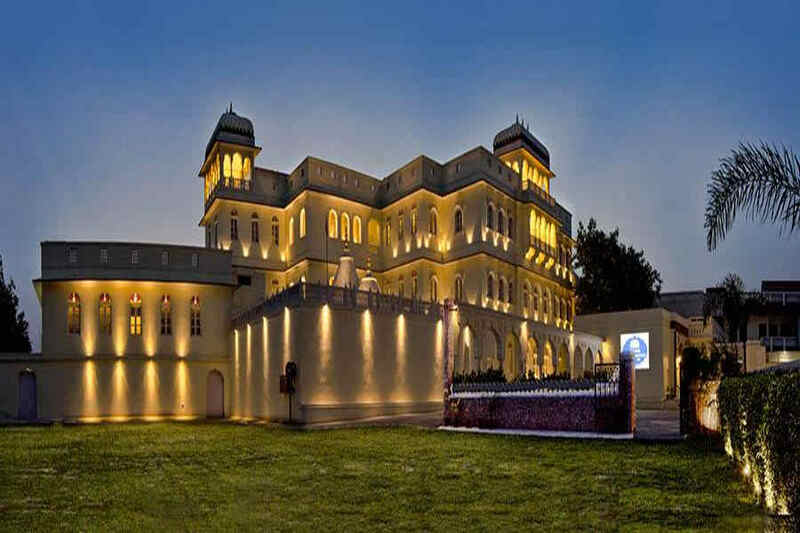 Relive the grandeur of a bygone era at this Heritage Resort At Panchkula which has stood the test of time for centuries. This historic Heritage Resort At Panchkula is situated in the quaint town of Ramgarh, on the outskirts of Chandigarh. The resort is also in proximity to many hill stations in the Himalayas. The spacious grounds of this resort feature beautifully manicured lawns and landscaped gardens that are soothing to the eye. 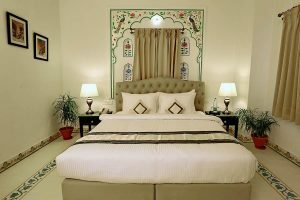 At this Heritage Resort At Panchkula, constructed nearly 325 years ago, you can experience world class hospitality and luxury, wrapped in historical elegance. The exterior has a palatial grandeur while the interiors are adorned by priceless historic art and antiques which have been passed down over eight generations of royalty. 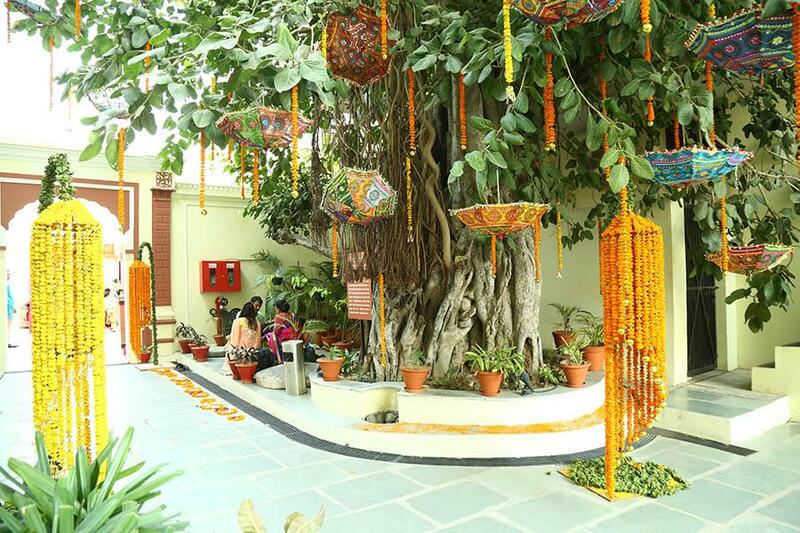 A stay at this elegant resort provides opportunities for unique experiences with art and craft for kids, a handicrafts shop, a temple, and yoga on the premises. The multi-cuisine restaurant serves up mouth-watering gourmet delicacies from around the world. 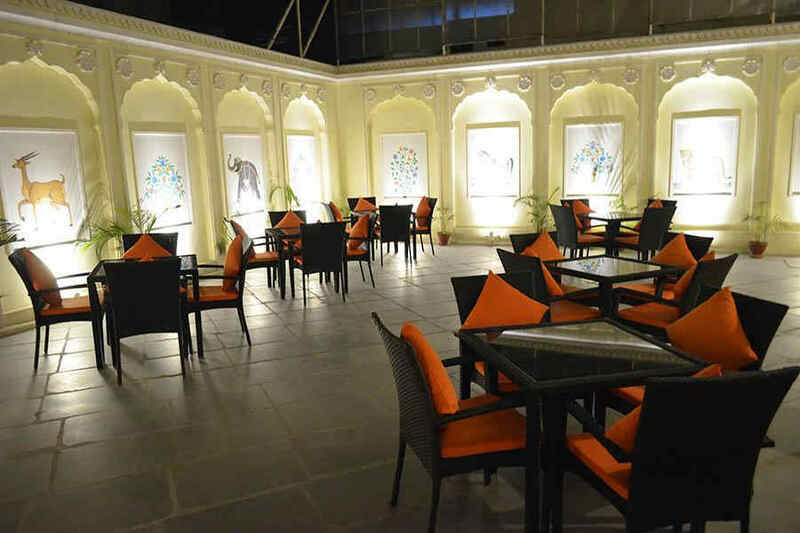 Indian, Oriental, and Continental cuisines are on offer to make every meal a culinary delight. The surreal courtyard as well as the bright and sunny rooftop restaurant adds a touch of modernity to this architectural marvel. 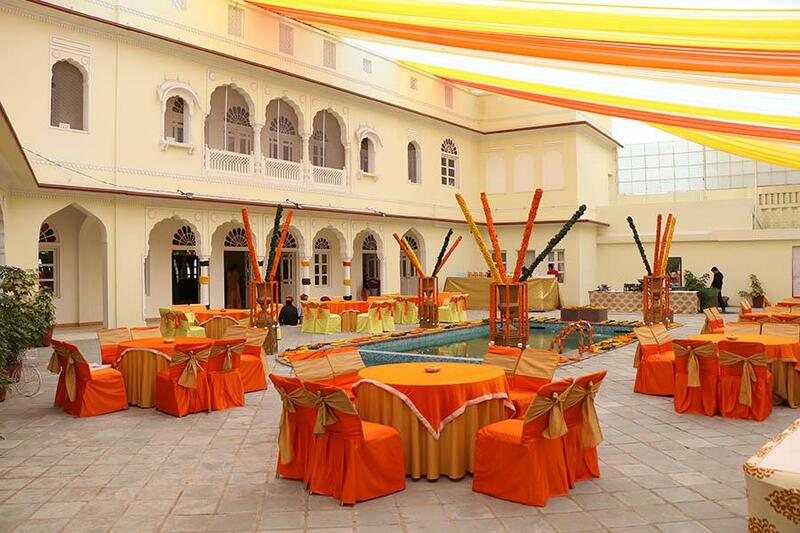 The resort is an apt choice for corporate meetings, weddings, and off-site events due the availability of varied venues. A grand swimming pool, indoor games, a gym, and a golf course nearby provide you with plenty of entertainment opportunities of international standards. 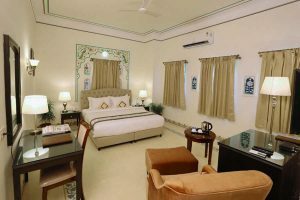 This heritage resort has 26 luxurious accommodations categorised as Luxury Rooms, Premium Rooms, Heritage Rooms, Heritage Suite Rooms, and Ramgarh Suite Rooms. Each room is an example of elegant opulence and luxurious comfort. 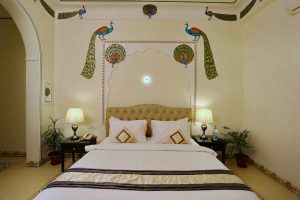 The walls in some of the rooms feature colourful and delicate paintings while plush furnishings are a given in all spaces. A stay at this resort holds immense promise of a journey into the past to give you a taste of the regal era. The resort has plenty of facilities to keep you satisfied during your leisure time. Enjoy some indoor games or work up a sweat at the gym. The kids can enjoy some arts and crafts activities while you tee off at the world class golf course just a hop, skip, and jump away from the resort. Browse through the curio handicrafts shop or sign up for a yoga session. You can also set off on an exploration of Ramgarh Fort which is nearly 360 years old. 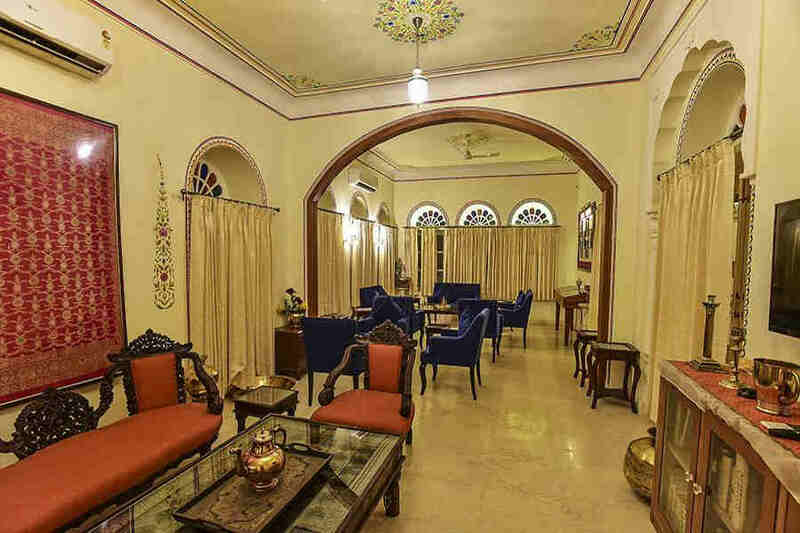 Though the fort is now renovated into a heritage hotel, many elements that narrate the history of the region are preserved in the structure till date. The Cactus Garden is close by and is Asia’s biggest one with 3,500 species including many rare and endangered species of the thorny plant. A stroll through the village of Ramgargh is sure to keep you enthralled with visuals of alleys and pathways that are at least three centuries old. 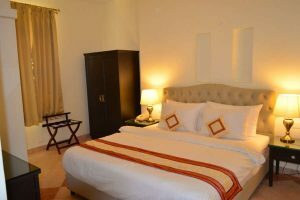 The famous Rock Garden of Chandigarh, Chattbir Zoo, and Fun City and Amusement park featuring water slides and a wave pool are some other places easily reachable form this heritage resort. Chandigarh Airport is the closest air at 21 km while Dehradun Airport is located around 180 km away. Indira Gandhi International Airport, Delhi, is about 258 km away. 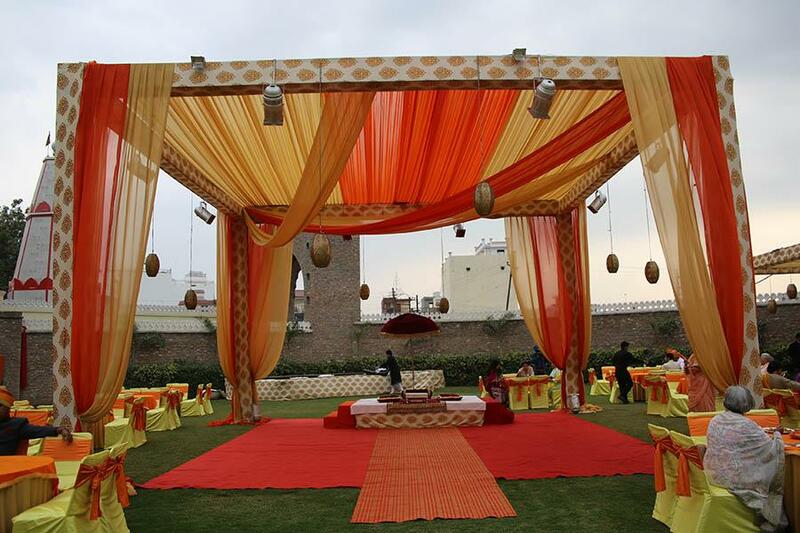 Chandi Mandir Railway station at 12 km and Chandigarh railway station at 13 km away are the closest to the resort. Dehradun Railway Station is around 175 km away while New Delhi Railway Station is at 253 km. Chandigarh city is at 9 km while Patiala town is 67 km away, both along NH7. New Delhi is accessible via the Jammu-Delhi road at a distance of about 249 km.